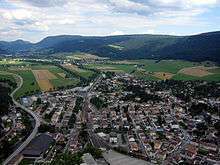 Fleurier was a municipality in the district of Val-de-Travers in the canton of Neuchâtel in Switzerland. 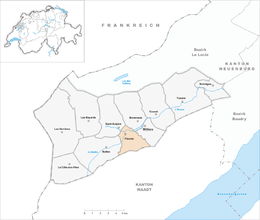 On 1 January 2009, the former municipalities of Boveresse, Buttes, Couvet, Fleurier, Les Bayards, Môtiers, Noiraigue, Saint-Sulpice and Travers merged to form the administrative district of Val-de-Travers. The Nobel laureates, physicist Charles Édouard Guillaume and pharmacologist Daniel Bovet, both originated from Fleurier. Parmigiani Fleurier and Bovet Fleurier are two luxury watchmaking companies, based in Fleurier. Geneva based Chopard has also facilities in Fleurier. Fleurier in German, French and Italian in the online Historical Dictionary of Switzerland. This article is issued from Wikipedia - version of the 10/25/2014. The text is available under the Creative Commons Attribution/Share Alike but additional terms may apply for the media files.